High Ceilings, Modern Open-Concept Luxury Kitchen: This House for Sale in Mont-Saint-Hilaire Is Simply Wow! Situated on the banks of the Richelieu River, in a popular area near the train station, this house for sale is sure to meet (and exceed!) your expectations. Even before crossing through the lobby, you will have a good idea of what to expect. 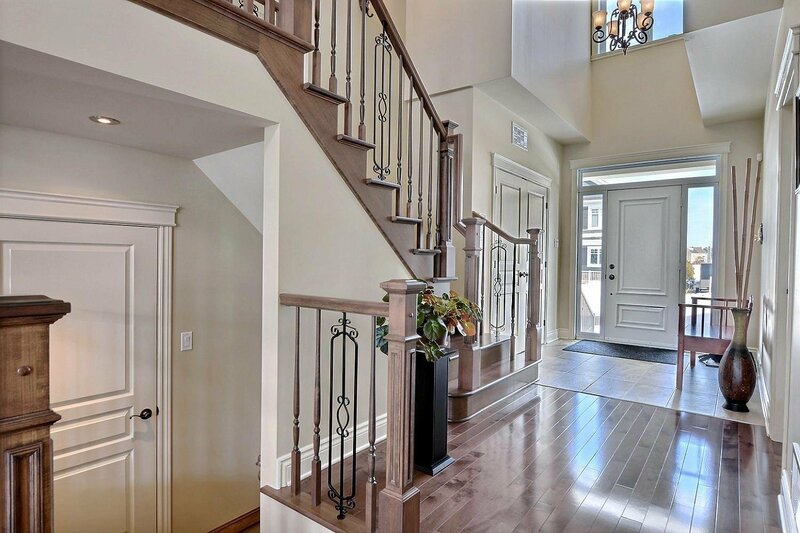 You will at first notice the beautiful staircase of wood and wrought iron. You will then be enticed by the vast open area with ceilings of unrivaled height, consisting of the living room and the dining room. You will probably have to protect your eyes from the sun since the natural light that fills the whole place is sure to dazzle you. The abundant windows let you benefit from beautiful sunlight throughout the day; this applies to rooms throughout the home. This sunlight streaming through the windows makes it possible to enjoy the superb wooden floors! The dining room is charming and is ideal for entertaining guests comfortably, especially with the gas fireplace that adds a unique warm touch! Adjacent to the open area, you will find the magnificent kitchen. You’ll be at a loss for words to describe it; all you see is beauty. Quartz counters, gas stove, splendid backsplash, beautiful island with lunch counter, cabinets with glass doors, walk-in pantry… You will be left speechless! You will then find an immense four-season veranda, accessible from the kitchen via beautiful French doors, from where you can enjoy the nature that surrounds you, in summer as well as in winter! … The bathroom off the master bedroom is likely to be the one you’ve been dreaming of. The immense Italian glass shower, the podium bath with its stone details, the XXL vanity… Remarkable! Upstairs, a beautiful space can be transformed according to your needs; boudoir, cinema room, additional bedroom… It’s up to you! You will notice that even in the basement there is beautiful natural light, partly thanks to the door of the extra entrance. A large family room with fireplace and bar areas will become the favorite spot for family movie nights or for spending the evening with friends! Two additional bedrooms, a complete bathroom, and a large workshop are also located in the basement. And what about the superb outdoor courtyard? With an in-ground, heated, and fully fenced pool, a nice shed, and a beautiful terrace, you will have all the ingredients necessary for unforgettable BBQ afternoons! This sumptuous 14-room home is an absolute must-see! Located in an exclusive neighborhood close to all services, schools, a bike path, and near Mont Saint-Hilaire where a host of sports is practicable, this rare gem is what you are looking for! You will find all the details of this property located at 735, rue Magloire-Laflamme, Mont-Saint-Hilaire, listed at the price of $649,000, by consulting its description (MLS # 28314157) and by contacting Linda Forget, real estate broker RE/MAX VRP. Don’t wait too long to visit this stunning house for sale; it won’t stay on the market long!